A professional wedding toastmaster wearing white tie and red tailcoat will add extra style and splendour to any wedding. Toastmasters provide confidence and a calming influence on the bridal party and will become a central figure for hosts and guests seeking help or assistance. "Just a note to say a formal thank you for making our fabulous wedding day so spectacular!" Toastmasters are also experts on wedding etiquette and protocol, which will ensure that the members of your bridal party who have roles to fulfil during the reception do so in the right order and without embarrassment. A Toastmaster will ensure that your day is a memorable one - organising the guests; liaising with the bridal party, registrars, photographers and catering staff; cutting the cake; introducing speakers (sometimes making the speeches) and making sure events run to time and in the right order, giving a seamless feel to your celebration. "We were so impressed by how well organised and perfect everything was." Having someone with responsibility for these elements of the reception will ensure that the event runs smoothly, eliminating pauses where the bridal party and guests aren't sure what's happening or what to do next. For those giving speeches, help and guidance can be given if required. For people already nervous about making a speech the toastmaster will relieve them of having to announce the order of the day to the guests as well, meaning that the bridal party can relax and enjoy the celebrations, safe in the knowledge that someone has an eye on the clock, the formalities and the guests. "Our guests commented on how excellent you were, too. Our parents also really appreciated your help, thank you." Wedding receptions require someone to co-ordinate, direct and announce the proceedings. Let Howard lift the burden of the day's events from the hosts, the bride, bridegroom, and best man, allowing the participants to enjoy their day. "We are writing to thank you for helping to make our wedding day so special." 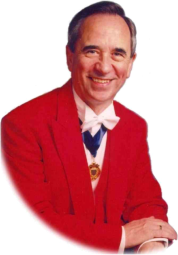 Hello; if you have not yet booked a Toastmaster but would like to know more about what I do, then read on. No matter how large or small the wedding party, things can go wrong and many months of planning can unravel very quickly. Because of my experience of hundreds of weddings, I will anticipate situations and from time-to-time deal with the unexpected. Throughout the day I will be chatting to the guests to keep them informed, and working with the photographer, the musicians, the banqueting team and the entertainers, etc; and attending to every little detail to ensure that all the various strands are pulled together for a seamless and successful day. Many people think that Toastmasters are there just to call people to the meal, introduce the bride & groom, look after speeches, and the cutting of the cake. They believe that their ushers can do this, and I would agree: Toastmasters do this, but good Toastmasters offer much more. I am sure you will have been to a wedding where no one seems to know what is happening, where guests are never immediately available for photography; the photographer takes forever; you cannot find Dad for the receiving line; you get very tired waiting for people and then, because of the delays, the meal has to be served late; the speeches over-run, and someone left the presents and flowers in a car boot, et cetera. The Photography: I work with the photographers and carry a copy of the shoot. I gather together the guests required for each group-shot in good time. This ensures that the shoot goes smoothly and as quickly as possible. Remember that you and you partner will be in shot for up to two hours and it is literally hard work for you both. Additionally, the photographers will be pleased because they know they can concentrate on the photography. Several months before your wedding I normally meet you during one of your visits to the venue or at your home. I will discuss with you the plan of the day and prepare a Day Plan that I keep with me throughout the day. I can help you with advice on every aspect of the big day using my experience of many hundreds of weddings. My role is to ensure that you have someone present who knows precisely what you want at every stage during the day and into the evening. I know how long each phase of the day should take and during the day I instinctively know if we are running to time or whether I need to make adjustments to keep on-track. I really do enjoy every aspect of weddings and take the time to get to know you. I am always full of enthusiasm and the desire to get it right. After all, it is one of the biggest and most expensive days of your life. Do you really want to risk things going wrong? I include in my services help for the speakers. I can provide them with many speech-writing notes, drafts & information, and I can offer interactive help in their preparation by reading their drafts and offering advice if required. I am increasingly being asked to deliver a speech to replace one, or even all three of the usual speeches, so that the men on the top table can relax and fully enjoy their day. If this service is required, I usually prepare a draft with your input beforehand. I work closely with the venue team. They will be delighted if I am booked, as this allows them to focus on delivering the facilities, the excellent catering, wine and all the fine detail associated with a major banquet. Some venues claim that they can provide a similar service as a Toastmaster – they cannot – they certainly do not have the time or indeed the experience to manage every detail during the day and evening. I spend time with you during the planning stage to check every detail before the day to get the planning fine-tuned. I take responsibility for every aspect of the day and evening (The vast majority of toastmasters have little or no experience beyond the end of the meal and most will not work later). If you are concerned about being too formal, don't be, my style is as informal or as formal as you wish. Although I normally dress in my Toastmaster ‘Reds’, I can also dress in standard Black Tie. I think it would be best described as relaxed yet quietly authoritative. If in doubt, please see some of the testimonials in these pages. My inclusive fees for weddings in the North West and Yorkshire start from as little as £250 from one hour before arrival (including civil ceremonies) to the end of the meal. Unlike the vast majority of Toastmasters for a small additional fee I can stay until after the first dance to look after the evening guests get the evening under way. Putting this into context of the overall costs of your big day: my fee typically represents something between 1% and 2.5% of the total costs - a small sum to ensure that your very special day goes without a hitch. I am there to give confidence to the top table that everything that they want to happen on this special day will happen. Should you want to speak to me before booking, please contact me through my contact form below.